Painted Red BC/CC this truck is slick and straight. Shaved door handles, shaved tail gate handle moved to inside of bed. Black Tonneau cover, rear roll pan with tail lights, stock tail lights saved, fiberglass hood. Custom grill, front bumper like new. Cragar SS rims chromed with BF Goodrich radial T/A white letter tires. Dual outside mirrors, tailgate has a Mural of the truck cleared over. Inside of bed painted to match the truck. Tinted windows. A REAL eye catcher! The interior is Black cloth and vinyl on a bench seat that looks new. Black padded dash looks new, black door panels look new. Power windows, black padded headliner, the sun visors look new. Tilt column, Grant steering wheel, B&M Shifter in the floor. Silver face Auto Meter gauges in a custom cluster. Panasonic AM/FM/CD player, Custom gas and brake pedal covers, black carpet, Black Chevrolet rubber floor mats. Seat belts. Looks really nice inside. Powered by a 427-engine hooked to a 700R transmission, aluminum water pump, polished A/C compressor, polished Billet brackets, Billet pulleys, polished ProForm 750 carb, Spectre dual polished air filter, chrome timing chain cover, chrome oil dip stick, headers, Black Chevrolet valve covers, chrome fuel pump, Billet polished master cylinder. Stainless radiator cover, power steering, newer hoses and belts, stainless on underside of hood and fender wells, power disc brakes in front, 12 bolt rear with drum brakes, ladder bars, dual exhaust with stainless tips. Sounds, drives and handles good. 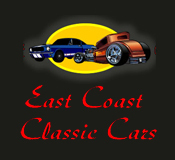 Visit our site at www.ecoastcc.com for more info.